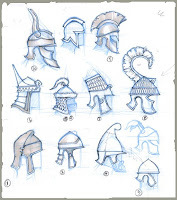 These are just a few helmet designs that I did for Titan Quest. Many of the designs are based on actual helms from the early bronze age but some are made up from pulling decorative elements and details from other ancient artifacts. When sketching helmets, armor or weapons, one the of main things I think about is trying to accentuate the silhouettes of each armor piece. Having a broad range of silhouettes give the biggest visual impact when character customization is a consideration. I might consider doing another pass on each one of these helmets to block out material changes. Through a series of texture swaps, one helmet might start off as cloth, then leather, then reinforced with metal details. Another thing I pay attention to when sketching is I consider the distance of an object to the game camera, or how big the object will be 90% of the time when it is on screen. There is no sense in putting in detail that will never be seen or add additional visual clutter to the texture. An even distribution of small detail in a texture will cause the object to appear busy. Instead I try and block out the larger detail and focus on the silhouette. I enjoyed creating these sketches and referencing ancient Greek, Egyptian and Persian culture. Very cool, I really like the clean style. If I ever need to ride into battle looking badass I know who to design my armor!